There are two constants in life: everybody dies in the end, and Stuart will always give a high-concept shark movie a go…no matter how off-putting the spelling of the title. Claire Holt and Mandy Moore play a pair of sisters, Kate and Lisa, who sign up for a shark cage dive whilst holidaying in Mexico. Thanks to the title of the film, we know that they very quickly find themselves on the ocean floor, trapped in the cage and surrounded by sharks. Anyone who’s read my reviews before knows that this is my jam. The restricted location allows for the writers to tick off the possibilities one by one, and I get satisfaction purely from watching our characters assess their options, make decisions and adapt to each crisis as they arise. And it’s good thing that that kind of stuff interests me, because hooooo boy, is this script bad. Actually, to be fair, each dramatic beat is perfectly placed, and each event cleverly ups the stakes. It’s the dialogue that consistently lets the film down. Which leads me to the next issue. The first thing that occurred to me when I heard about the premise of this film was this: how will the two characters communicate? 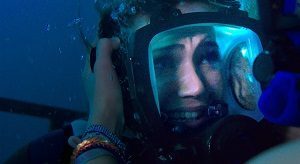 Well, 47 Meters Down’s approach is to have our protagonists wear full face masks complete with radio contact between them. Except it’s established at the start of the film that they’re diving with a shoddy operator, in an old rust bucket of a boat. So the super high-tech diving equipment doesn’t really make sense. But we can ignore that, right? There’s no need to be picky. However. Despite being full face masks, they still obscure the actresses’ faces most of the time. It’s entirely possible that 70% of this film features diving doubles, because we can’t see Kate and Lisa clearly, which means I’m focussing on the awful dialogue even more. 47 Meters Down does feature somewhat realistic lighting though; basically it’s very, very dark. Which is a nice change from the usual underwater scenes you see in the movies, where the bottom of the ocean looks like shallow, crystal-blue Caribbean waters. It presumably helps with the VFX too, which get the job done well enough. But you know what? I still enjoy this kind of movie, no matter how trashy. It sure ain’t The Reef, Open Water or Black Water, but at least it’s not Shark Night 3D or Bait.